Our congregation is an old one, steeped in interesting history and service to our Lord. Our earliest record is “Holy Communion was received on Lord’s Day, November 20, 1794”. 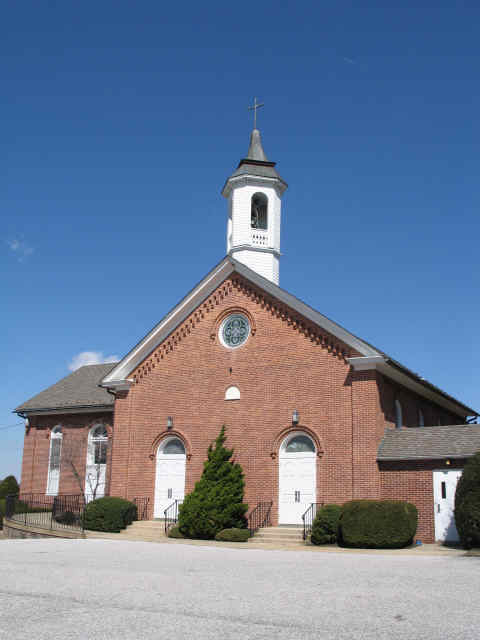 We are believed to be the oldest existing Lutheran congregation in Baltimore County. The earliest church building was made of logs, followed by one of stone in 1838. The present brick structure was built in 1882 on a foundation of stone from the old church. The cupola from the old church surmounted the building. This cupola was taken down in 1999, refurbished and reinforced to hold the 1882 bell. At this time, the Cross of Christ replaced the former weather vane that was on top of the cupola. St. Paul’s doors reopened for worship in August 1996, and we rejoiced and gave thanks to God at the rededication of the church building on October 20, 1996. St. Paul’s history has been both independent (1897 – 1918) and affiliated with other congregations, most recently with St. Mark’s, Hampstead and Christ Church, Trenton as the Upperco Lutheran Parish. St. Paul’s has been independent since 1982. There have been thirty-five pastors; our last full-time pastor, The Reverend Melvina Stricklin, the first woman to be called, served October 8, 1995 to August 30, 2015. Interim pastor, The Reverend R. Carl Myers, has been guiding our worship and studies during our search for a new full-time pastor. Our Church, now 224, is alive and growing. There is a thriving Sunday School, a lively Youth Group, many dedicated groups including Shepherds, Service and Fellowship, Outreach, Spirituality, A Church-wide Prayer Circle, Bible Study for all, and more! The welcome mat is out for you to join us whenever you can. Although our history is precious to us, our focus is on Jesus Christ in our present and future.